✏️Our First Day of School for our 4’s is Thursday, September 6. 🖍Our First Day of School for our 3’s is Friday, September 7. 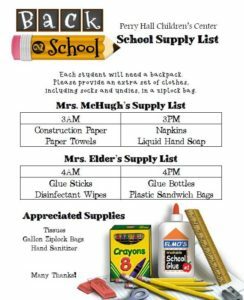 ✂️You are welcome to bring your school supplies with you at your Meet the Teacher Conference (Sign up at Parent Meeting), or on the first day of school. 📚Just a reminder that class is shortened to 2 hours for all classes on the first and second days.